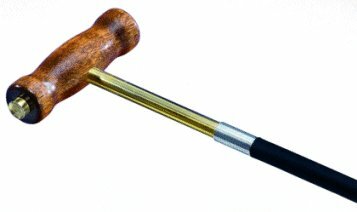 TC's T-Handle Short Starter features a hardwood handle with a 2 piece solid brass rod, coupled with standard 10-32 threads. By removing the seating end of the brass rod, and screwing the T-Handle onto a standard ramrod, it will extend the length of your ramrod for easier seating of projectiles, especially during continuous shooting at the range. It will provide you with extra leverage for firmer more uniform seating. It converts your ramrod to a range rod. For more Muzzle Loading Accessories Click Here.